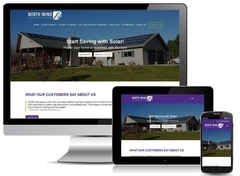 North Wind Renewable Energy wanted to revamp their website and their brand. With the help of Virtual Vision, North Wind built a more modern, elegant looking website and updated their verbiage to concentrate on solar energy and electric vehicle charging. Click here to view the new North Wind website. Virtual Vision search engine optimized the site and North Wind is now showing up in the top placement positions of Google. Struggling to be seen with your website or want to rebrand? Call Virtual Vision at 715-675-9194 for a free consultation.